THIS LISTING IS FOR A SIZE X-LARGE (12-14) CHILD COSTUME. PLEASE MAKE SURE YOU'RE PURCHASING THE CORRECT SIZE. No need for an X-ray machine when you can see through your child bones in this hip Skeleton Girl costume. 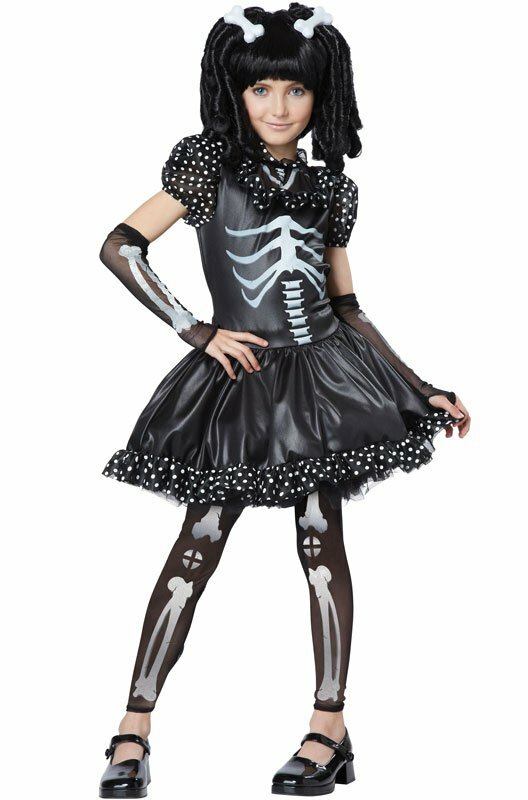 Our Skeleton Girl child costume features a dress, leggings, glovelettes, and two bone clips. X-Small (4-6) : Chest - 25" Waist - 24" Hips - 26" Height 46"
Small (6-8) : Chest - 27" Waist - 24" Hips - 28" Height 53"
Medium Plus (8-10) : Chest - 32" Waist - 28" Hip - 33" Height - 55"
Large (10-12) : Chest 30” Waist – 26” Hip – 32” Height - 58"
Large Plus (10-12) : Chest 33" Waist - 29" Hips - 35" Height - 58"
X-Large (12-14) : Chest 32" Waist - 27" Hip - 34" Height - 61"